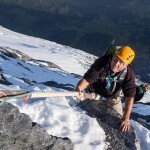 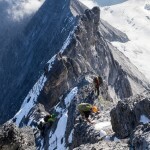 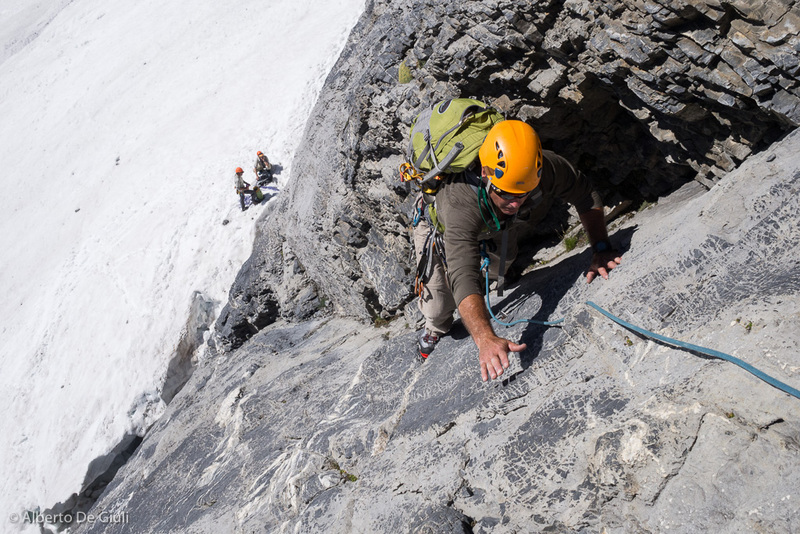 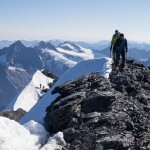 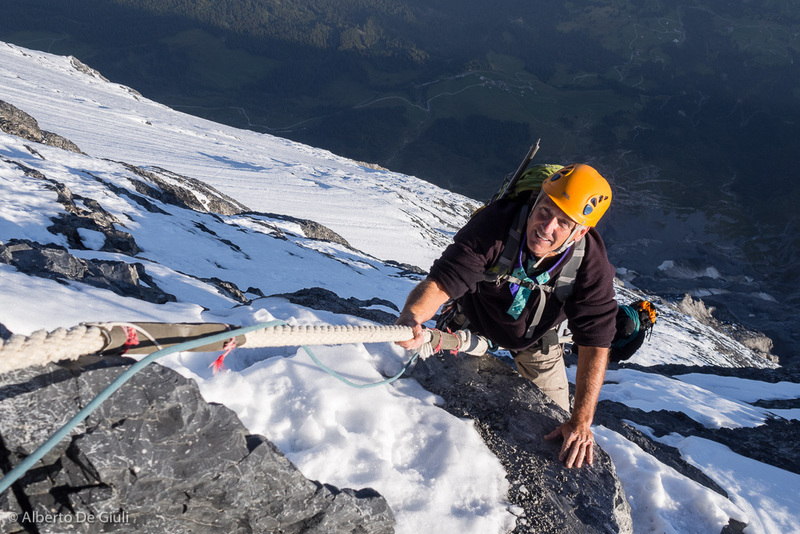 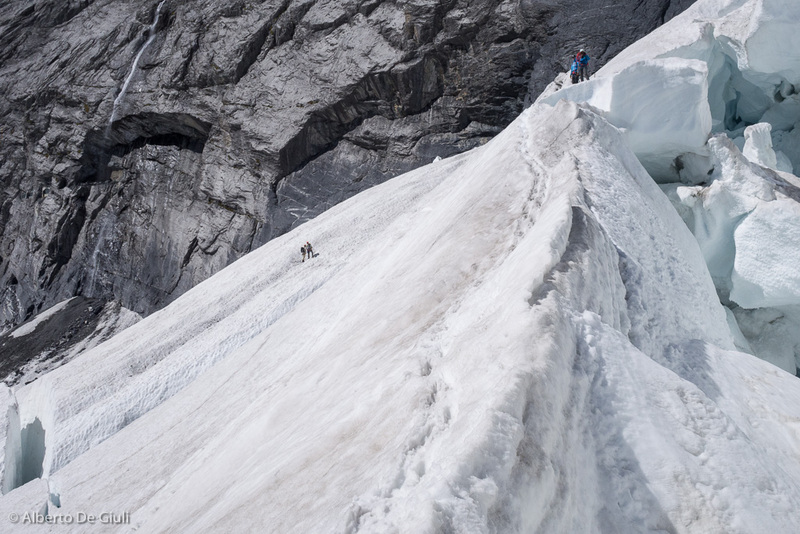 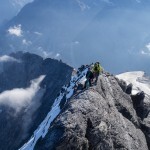 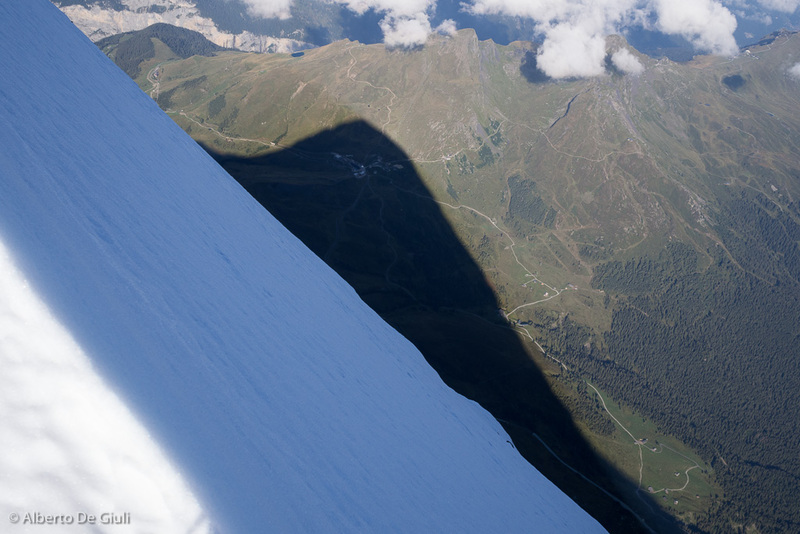 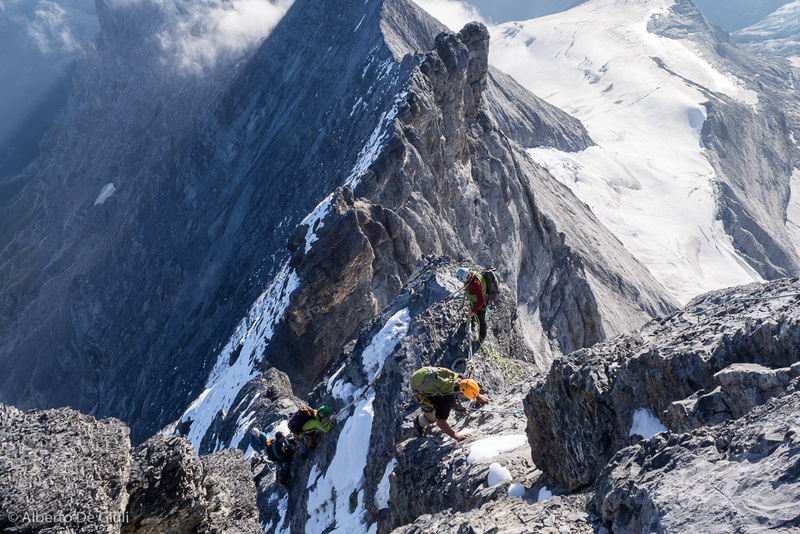 Climbing the north ridge of Piz Badile and the Mittellegi ridge on the Eiger. 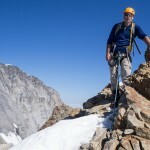 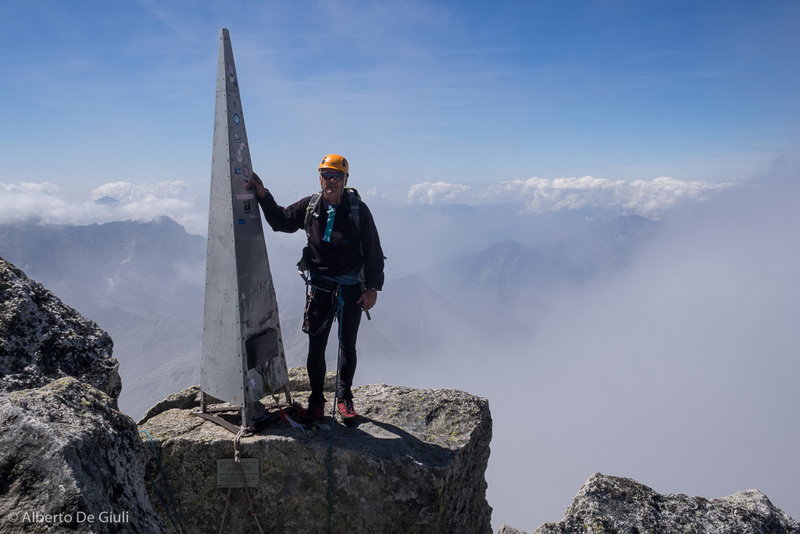 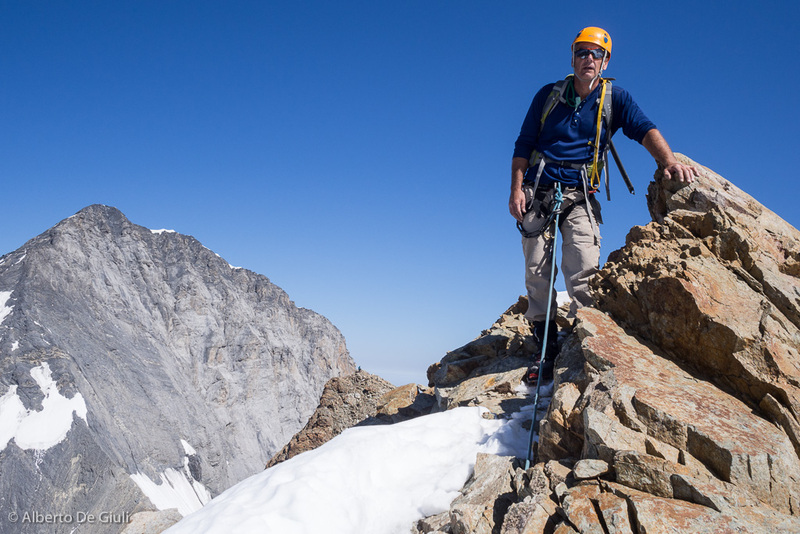 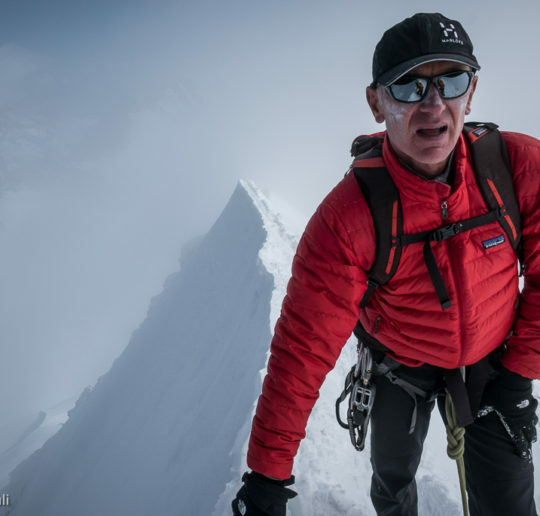 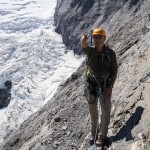 When I got an email from Marty from the US asking me to guide him on the North ridge of Pizzo Badile and on the Mittellegi ridge on the Eiger, I asked myself : how did he find me? 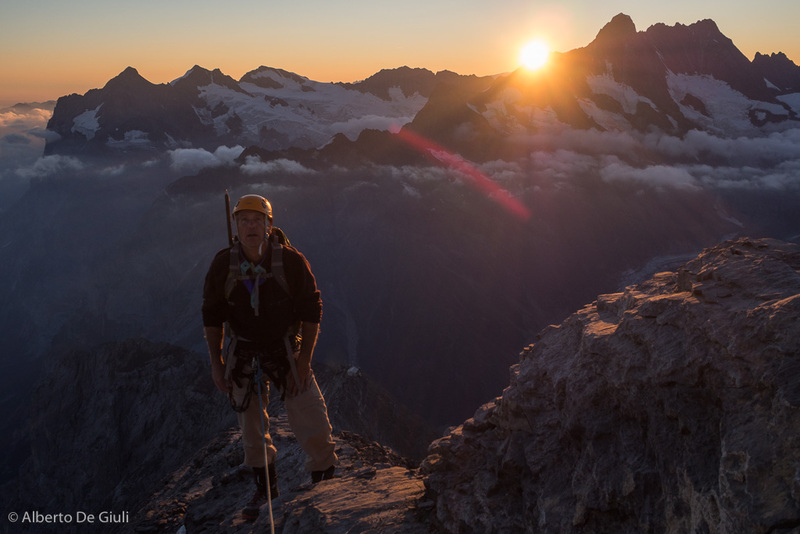 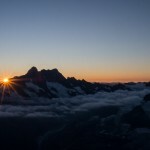 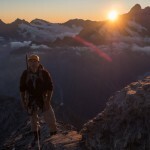 I never climbed those two mountains before, I’ve never talked about it on my website…later I found out I have to thank Dan Patitucci and his beautiful report of our climbing trip a few years ago on Zinalrothorn published on an American outdoor magazine. 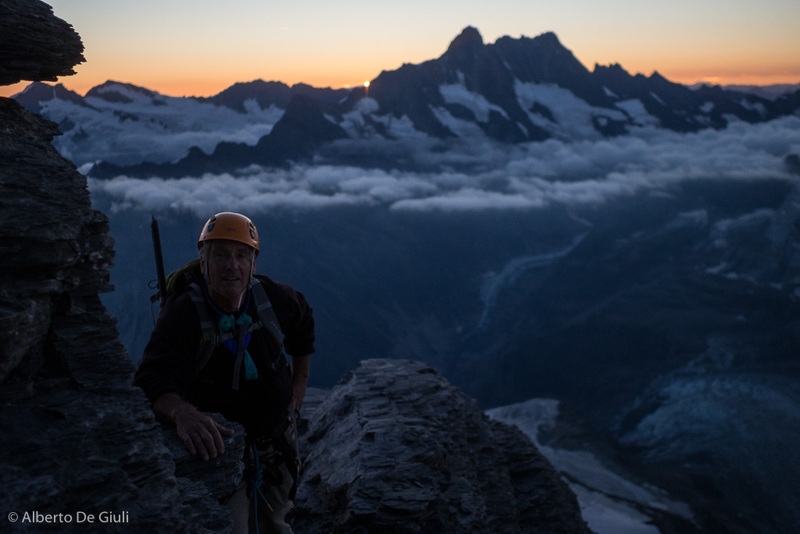 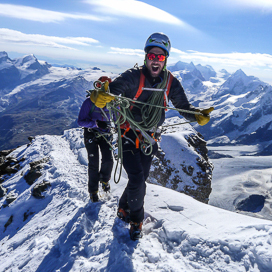 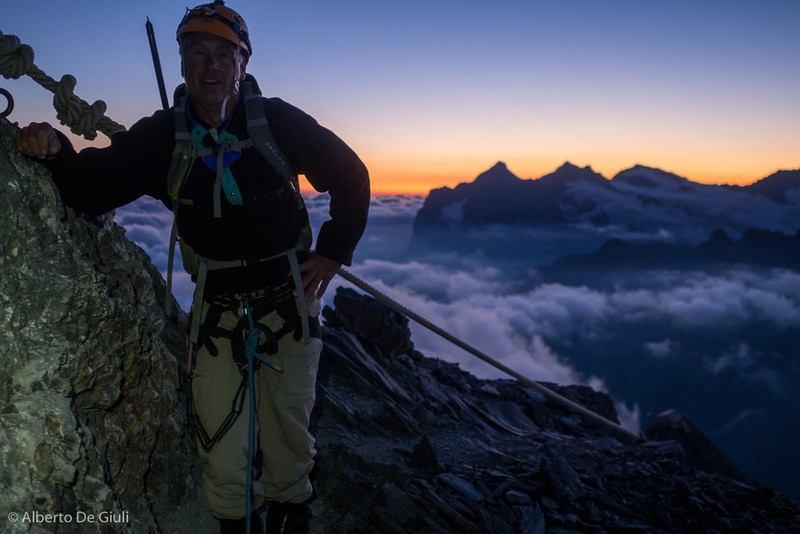 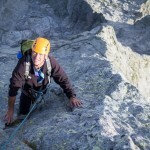 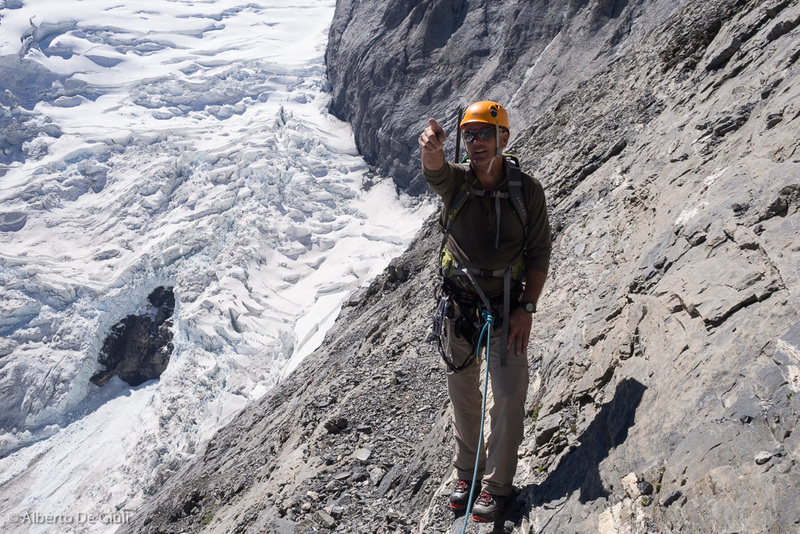 Thanks to the photos and the words of Dan, Marty decided that I would be the right guide to chase his dreams to climb both the Piz Badile and the Eiger on a week trip in the Alps. 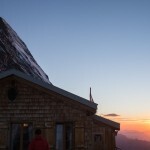 Our climbing trip was all organized and set at the end of May, I booked the nights in the Sciora Hut and at the Mittellegihutte as if they were magic numbers, hoping to be lucky with the weather and the conditions when our time would have come. 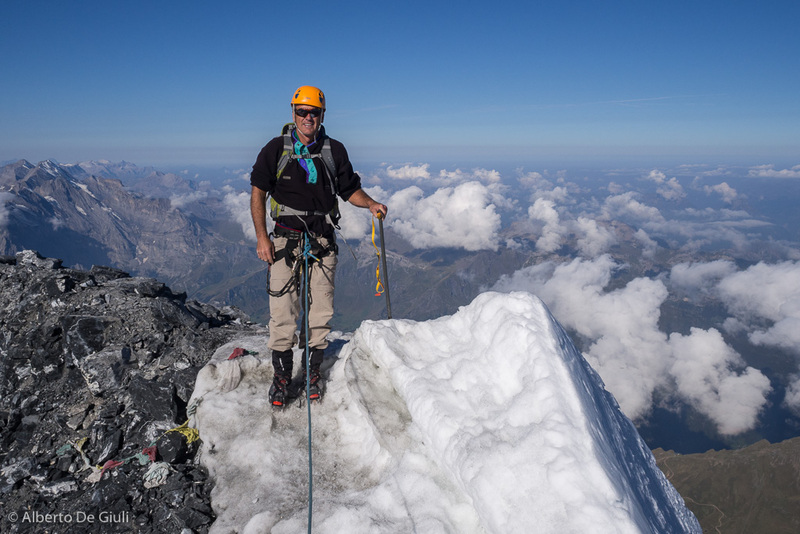 This is the perfect summer for such big climbs, weather had always been beautiful until the middle of August, when a low pressure hit the Alps and brought a lot of snow in the Valais, on the Oberland and in the Central Alps. 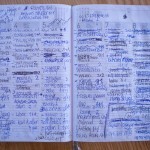 “Is it the beginning of the end of our project?” I was wondering. 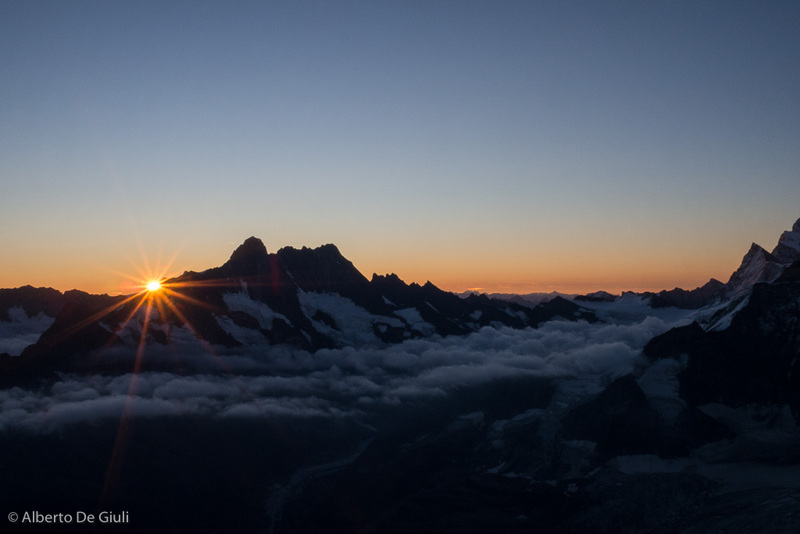 We suddenly beagn to look at the weather forecast, it looked like the high pressure was right on its way back, they were even talking about the return of the summer heat wave we had back in July. 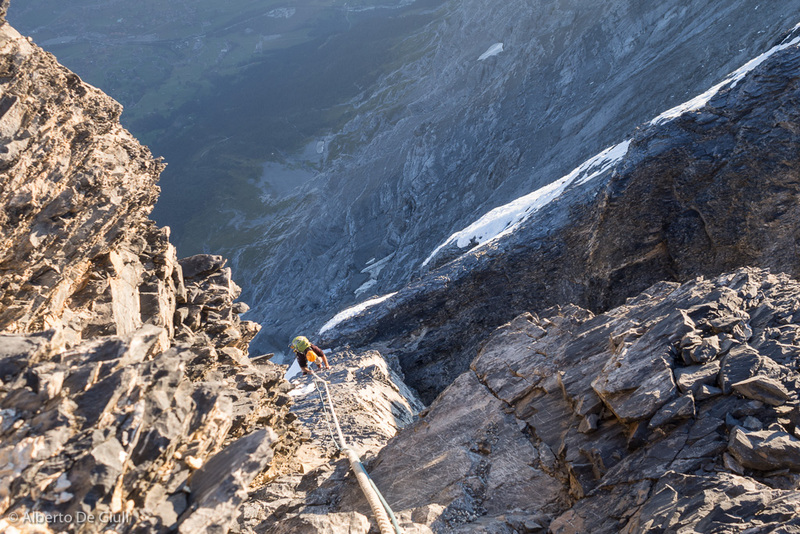 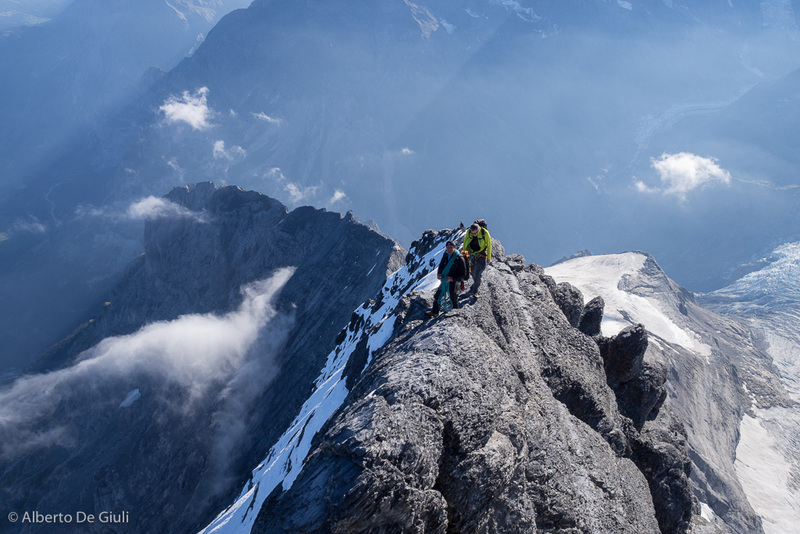 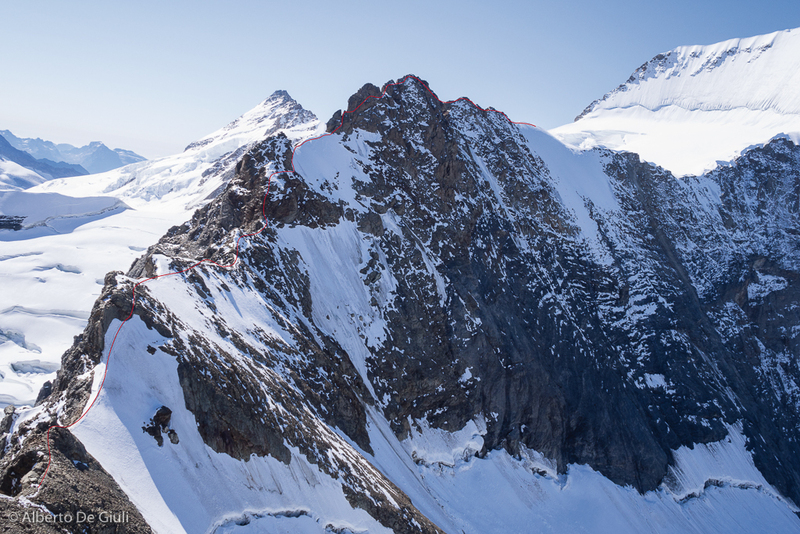 We were getting close to our date and the temperature was rising up as predicted, our project to climb the north ridge of Piz Badile and the Mittellegi ridge on the Eiger in five days was shaping up and we could slowly begin to believe. 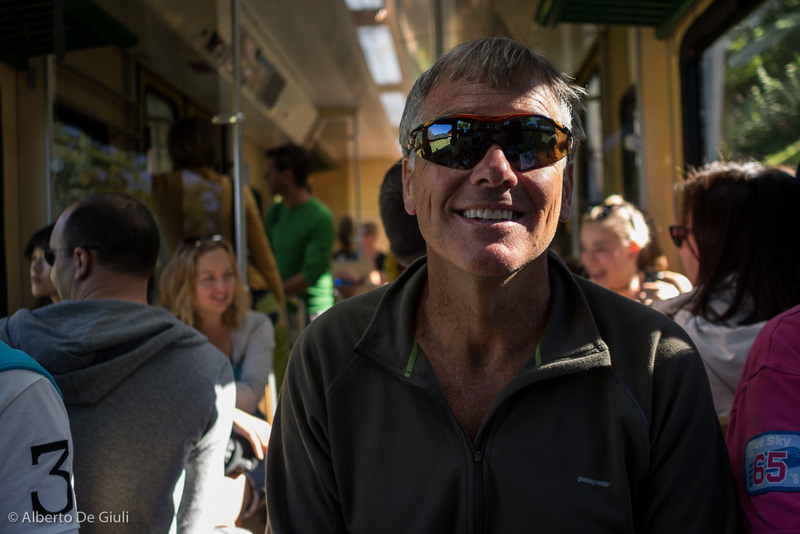 So the last week of August came, I picked up Marty in St.Moritz, the air conditioning was full on inside the car, luck was on our side. 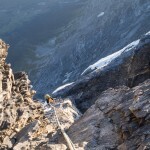 We decided to climb first on Pizzo Badile to avoid the weekend crowd, and to get acclimated for our journey on the Eiger. 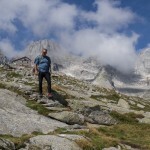 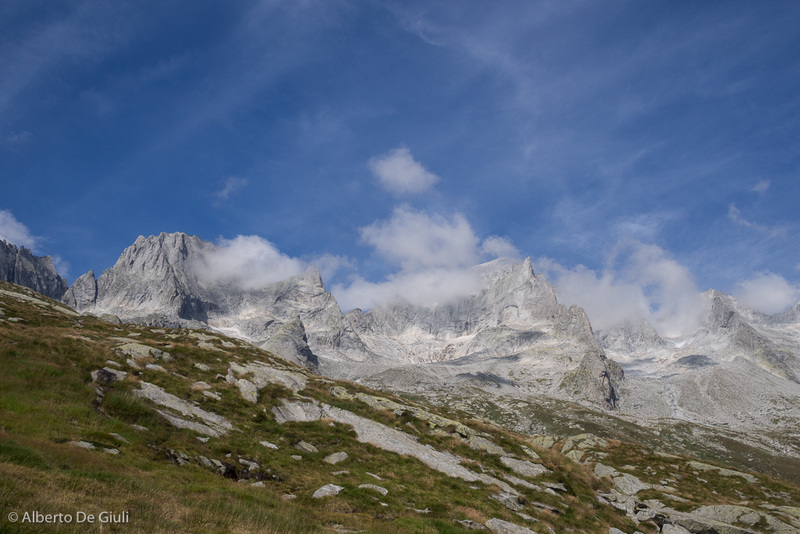 The approach to the Sasc Four Hut from Laret in Val Bondasca (this is the spot where you leave the car) is pretty tough when it’s so hot like those days. 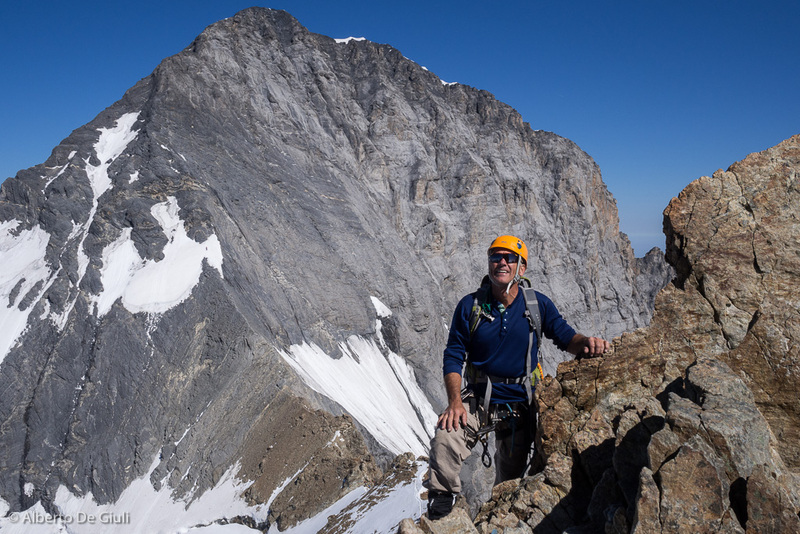 As we got to the hut, we found out there were only a bunch of climbers going up for the north ridge the next day, the route looked dry and we were expecting a perfect bluebird sky. 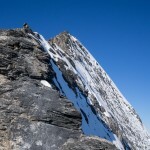 The north ridge of Piz Badile. 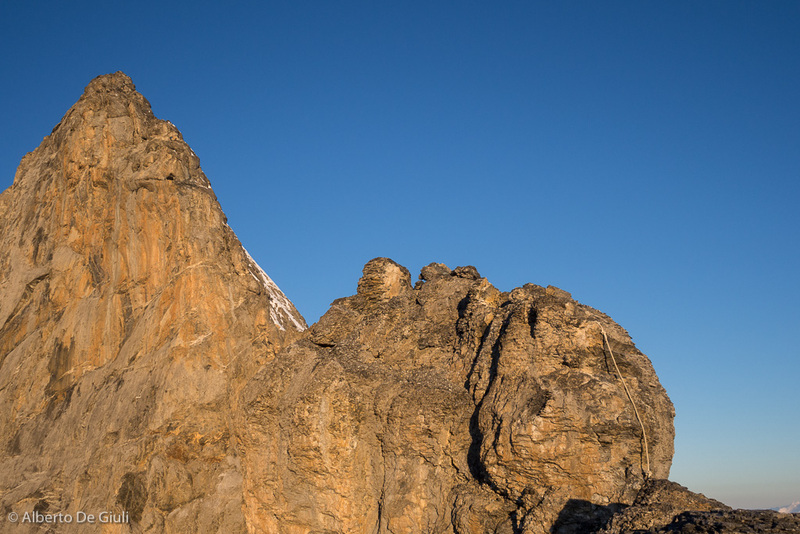 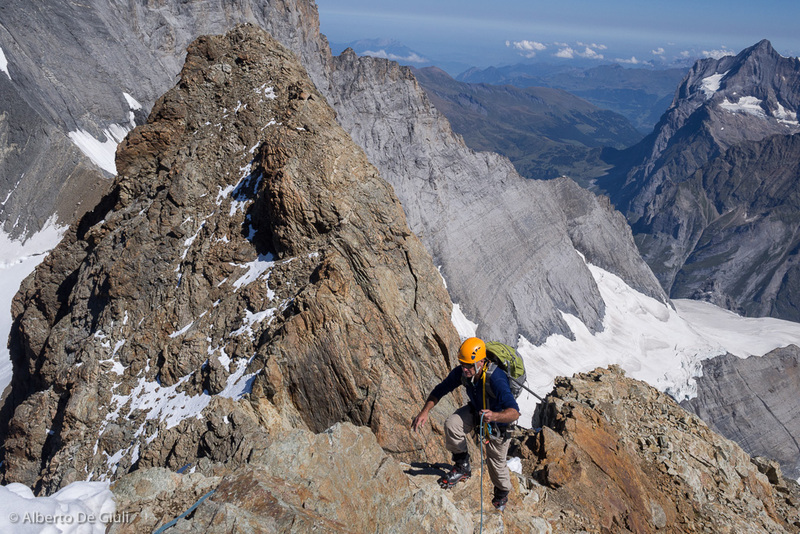 The north ridge of Piz Badile is a super classic climb of the Alps, rated “D” means “difficult” as it gets harder up to grade V (5a in french grade). 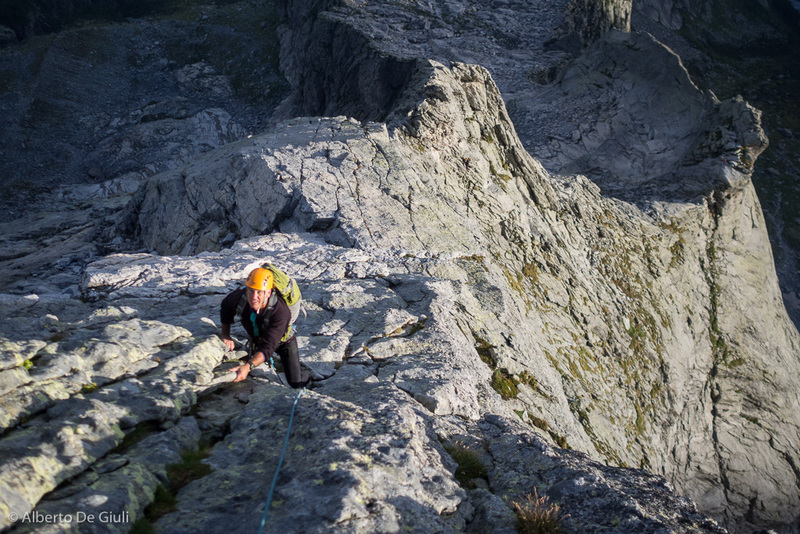 The north ridge delivers a great climb, it’s a 800 meters vertical climb on perfect granite where you need to move steady and quick due its lenght. 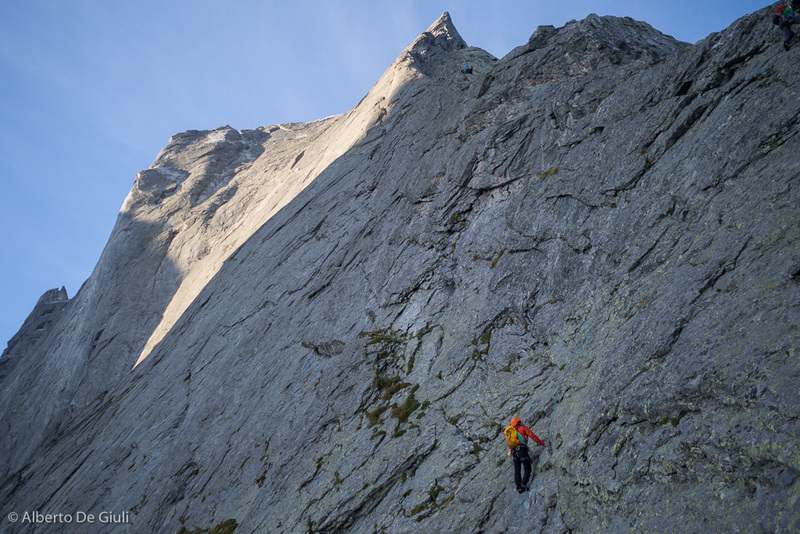 After counting about twenty pitches (we even linked some easier pitches using a tibloc) we both lost count, it’s a pretty long climb! 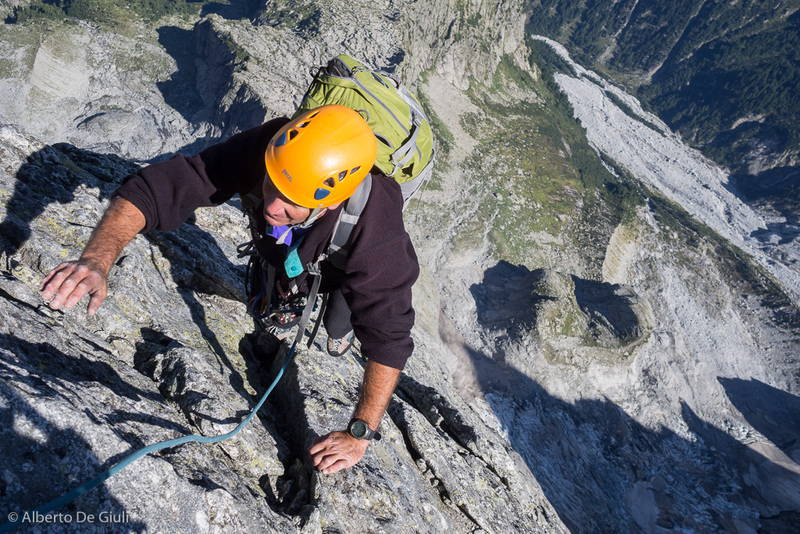 The route is well equipped with some bolts along the pitches and bomber steel anchors every 30 meters for abseiling if you need to bail, but it’s recommended to add few cams on your rack as the run outs are pretty big. 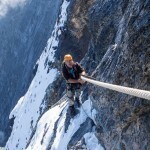 I read on the Internet that many people have rappelled down the route on their way back, but this is an option I would never take unless it’s necessary. 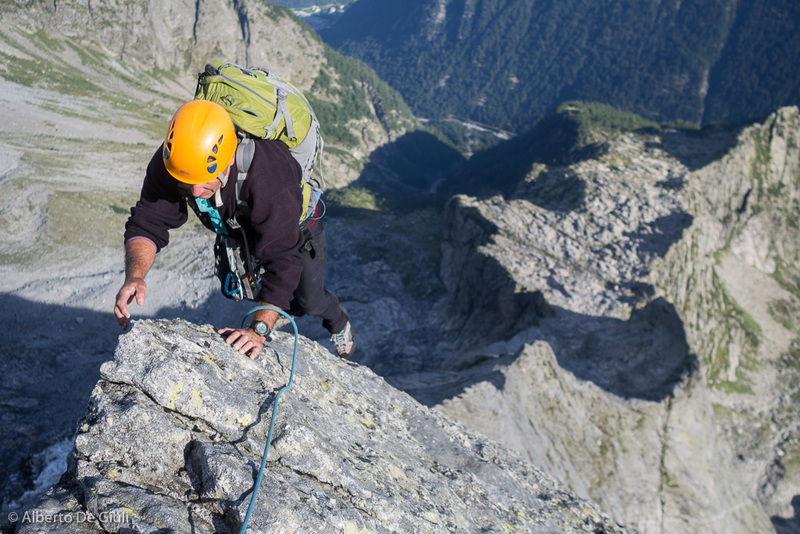 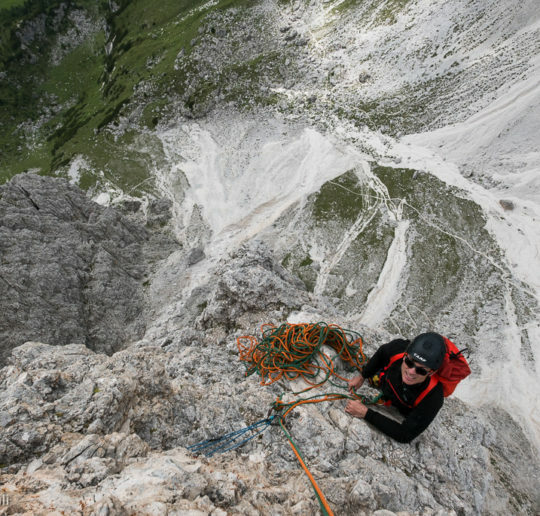 First of all, if you want to rappel down the ridge you better not climb to the top of Pizzo Badile (or better, you can climb to the top but the way back to the first anchor is not easy and short). 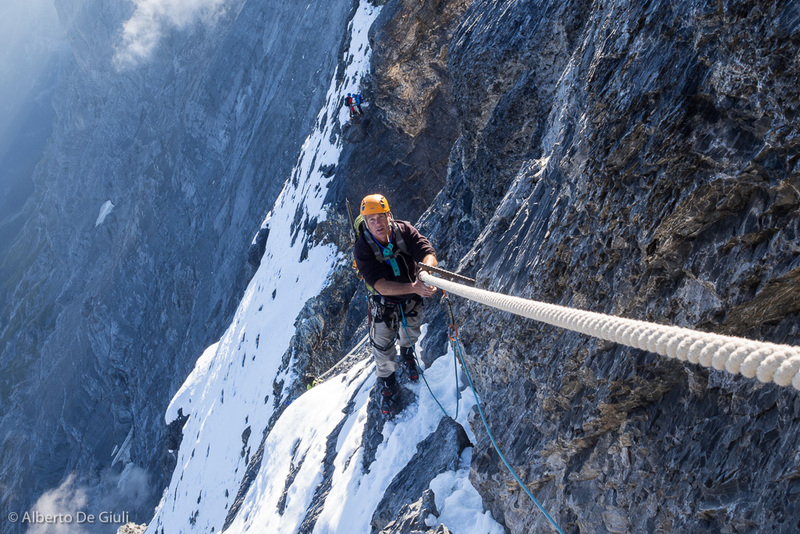 Also, I’m pretty sure it takes a lot of time to rap down the route, with all the issues that might happen while rappelling (getting a rope stuck, for example). 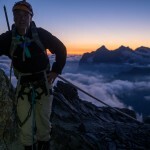 It’s so nice to climb up to the top and go down the normal route on the Italian side, you can still plan to sleep at Giannetti Hut or hike straight down the valley to Bagni di Masino, as we did, but be aware that it will be a stroke for your legs and feet after 5 hours of technical climb and then 2400 meters to hike downhill. 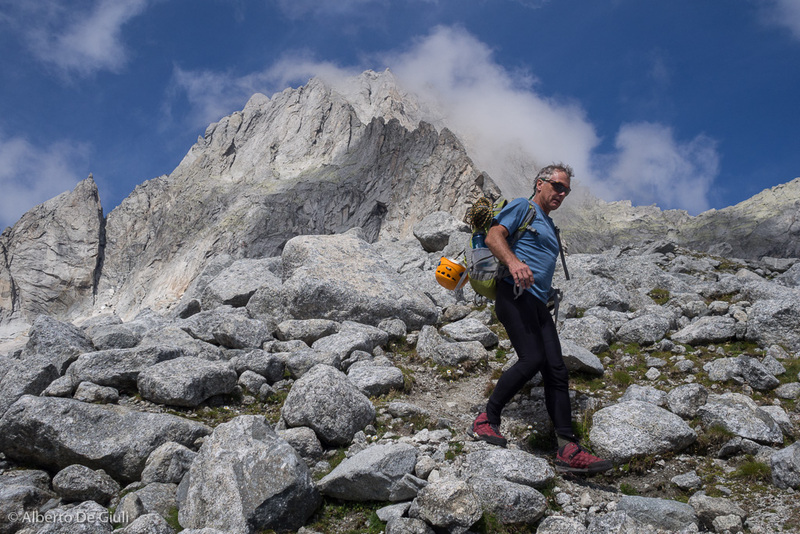 As you reach the bottom of the valley you could get picked up by a taxi service that must be booked in advance (you can also organize it with other teams so to split the cost), they will bring you back to the car park in Val Bondasca in a couple hours. 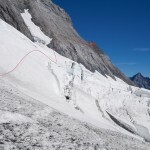 The route from the Challifirn to the Mittellegi Hut. 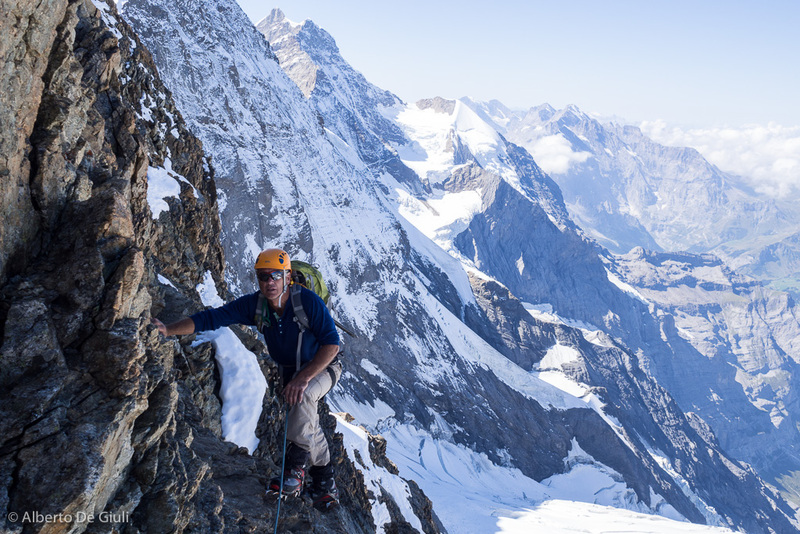 As we takled the north ridge of Piz Badile, we took a day off to drive to Grindelwald and recover the legs for the next project, the Mittellegi ridge on the Eiger. 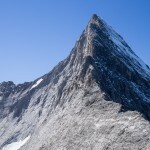 It normally takes 2 days to takle the Mittellegi ridge. 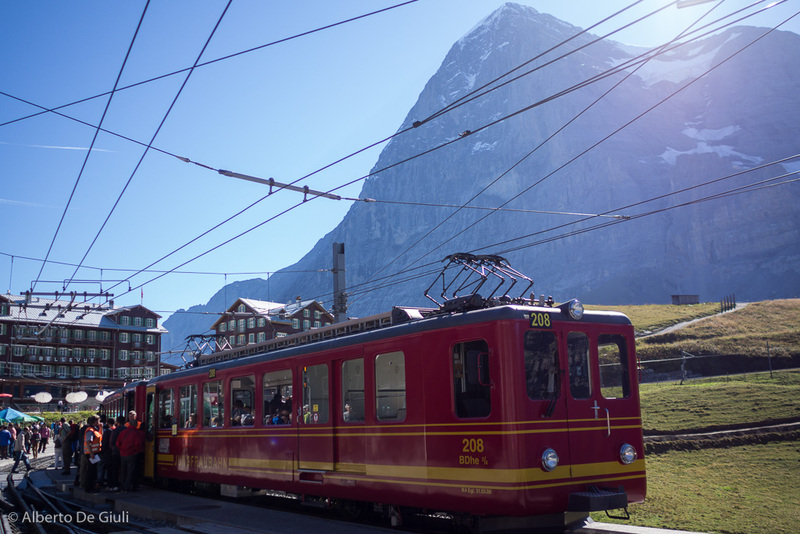 Day1 is the approach to the Mittellegi, the climb itself is pretty short, as you take Jungfrau train from Grindelwald to the Eismeer station via Kleine Scheidegg. The train stops for a little break here so the tourists enjoy a dramatic view down the glaciers, but for the climbers this is the time so say goodbye to civilization, getting through a little door that takes you down a windy and pitch black tunnel, you follow a creepy spiral staircase and few minutes later you are on a exposed ledge above the Challifirn glacier. 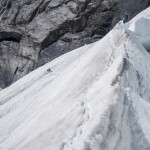 You gear up and you cross the Challifirn glacier navigating around some crevasses, the serac under the south of the Eiger was quiet, and in half an hour you reach the base of the rock wall where begins the real climb to the Mittellegi Hut. 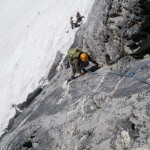 You have to climb up 3 pitches (the first one is the most difficult, a bit slippery and polished, and it’s also the “test” the guides use to check if the client is up to the Eiger) to reach a pretty big ledge that cuts across the base of the Eiger, this is a steep wall much more similar to rubble pile, as debris and loose rocks of every shape are everywhere. 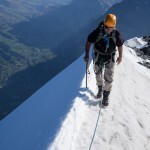 The first part along this ledge is easy, it gets very narrow here and there and you always need to be extremely careful and focused while moving short roped. 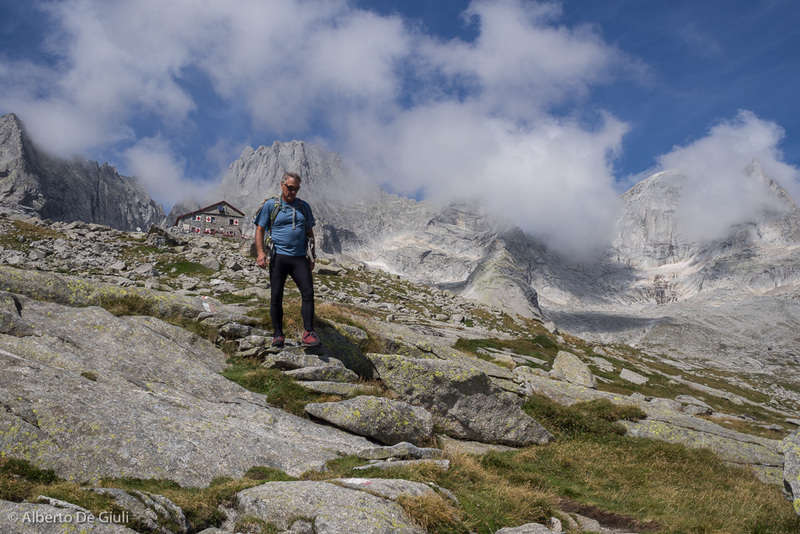 The hut gets closer and you have to pay close attention choosing the right track as in some spots footsteps are everywhere and the cairns marking the route are very rare. 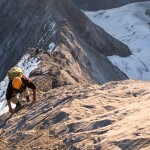 It’s a tough terrain, you better find out the right route if you don’t want to get in trouble. 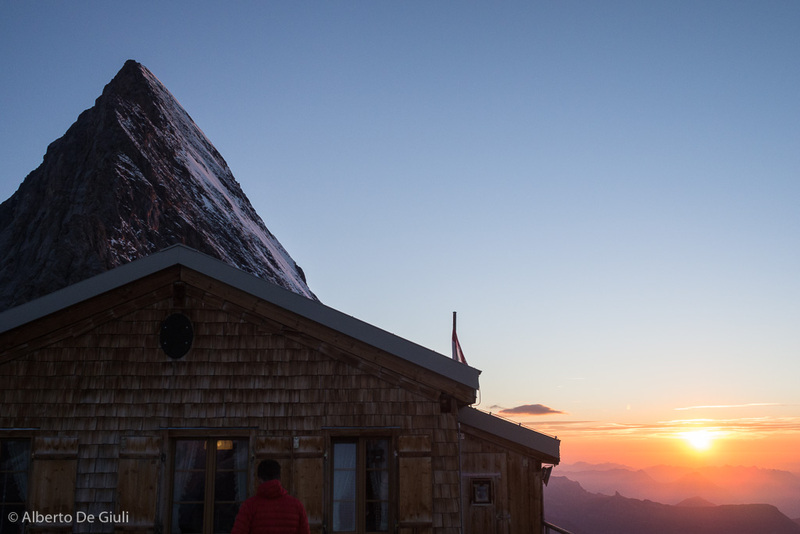 If you get into the right track without wasting time you can reach the Mittellegi Hut in a couple hours, that’s the reason why local and experienced guides generally leave the Eismeer station at 3.30 in the afternoon of the approach day. 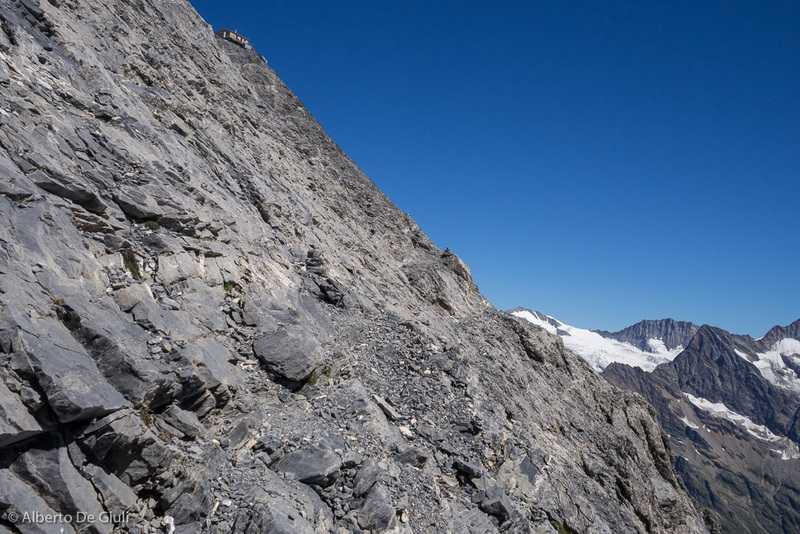 The Mittellegi hut, perched on the narrow rocky ridg, it’s a beautiful cozy and simple eagle nest right at the beginning of the Mittellegi ridge, looking at the climb from here it looks steep, severe and a bit intimidating. 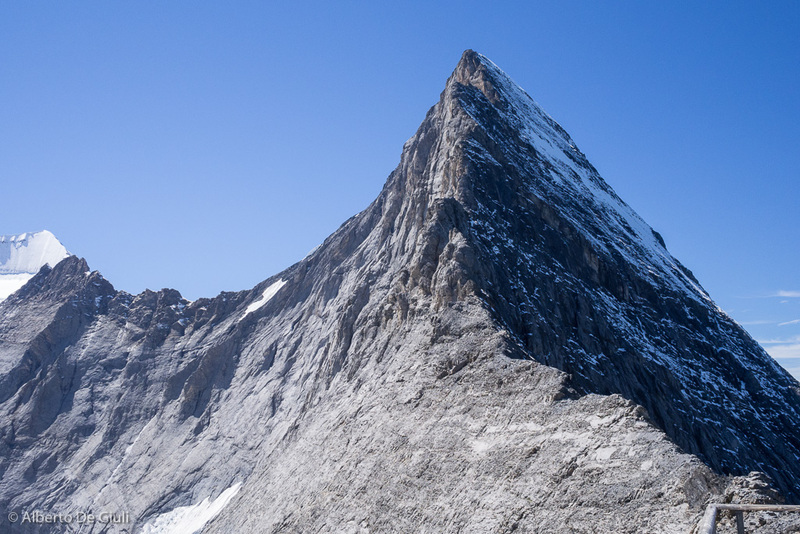 Welcome to the Mittellegi hut, the Mittellegi ridge starts right behind it. 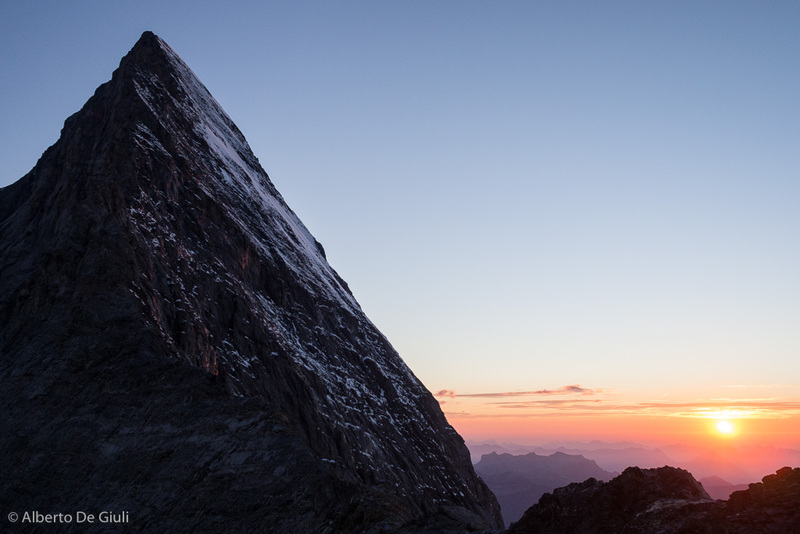 If you get up here early in the day, there’s plenty of time to rest in the comfortable dorm, the next day will be a big journey . 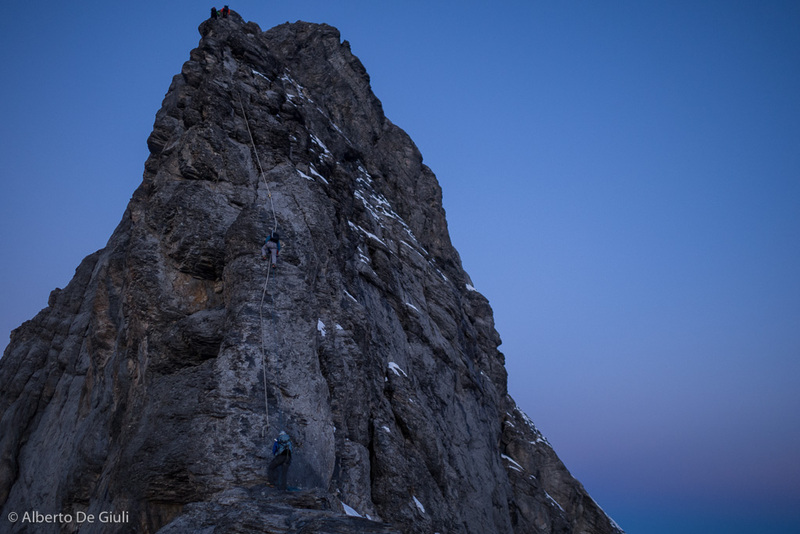 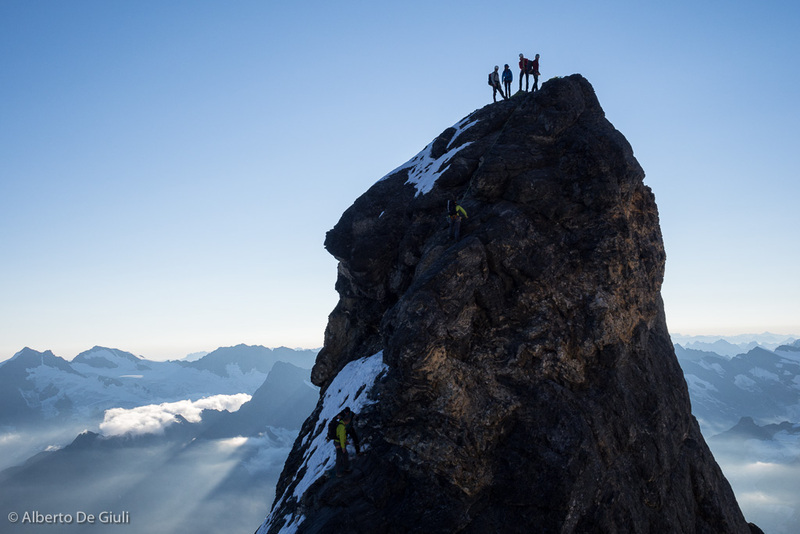 Fortunately, the hut can’t take more than 35 people, the traffic along the Mittellegi ridge is nothing compared to the Matterhorn, and each team has its own space and you can follow your own pace without struggling. 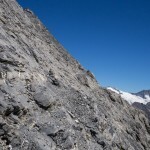 The conditions we found were perfect, the rock was totally dry, just a little bit of snow before the summit and again all still dry all the way down to the Eigerjoch. 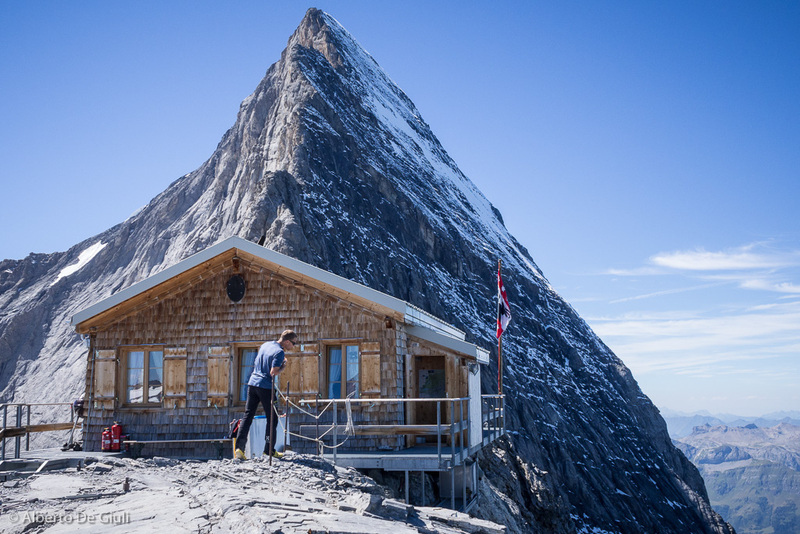 It takes generally 4 hours to climb to the top of the Eiger from the Mittellegi Hut, and you have to count the same time for the descent. 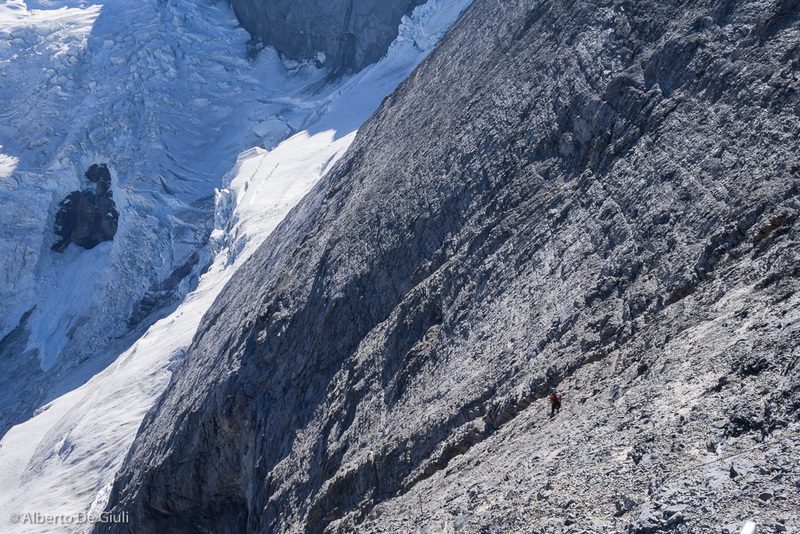 On the way down you generally have to go through a rocky ridge with some technical climbing sections up to grade 4 that seems never ending. 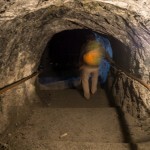 You got to move fast if you don’t want to get caught in bad visibility that could be common around here. 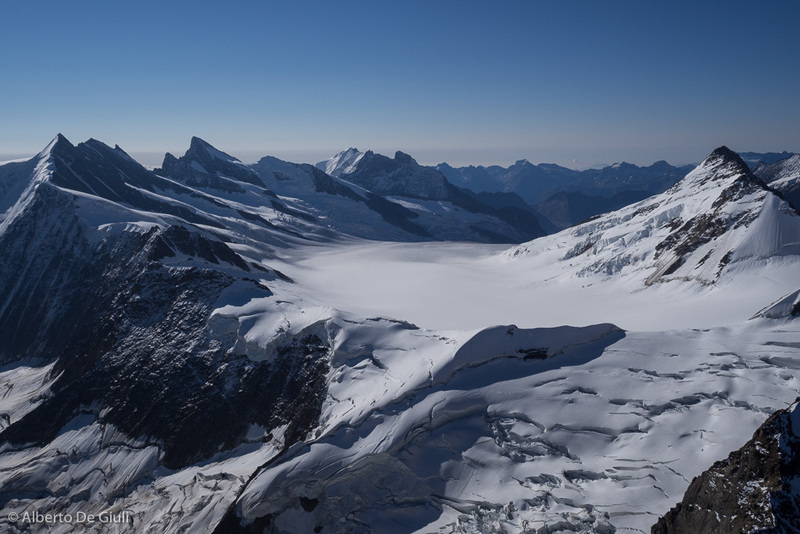 Our journey went so well and smooth at 2 pm we were already back at the Junfraujoch, after less than 8 hours to traverse the Eiger via the Mittellegi ridge. 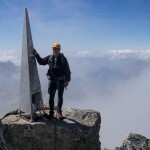 I’m so happy for Marty, we made his dream come true after 2 attemps to the Mittellegi ridge some years before. 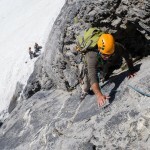 For me it was a great satisfaction to guide somebody to the the top of Pizzo Badile and the Eiger, two mountains I never climbed before. 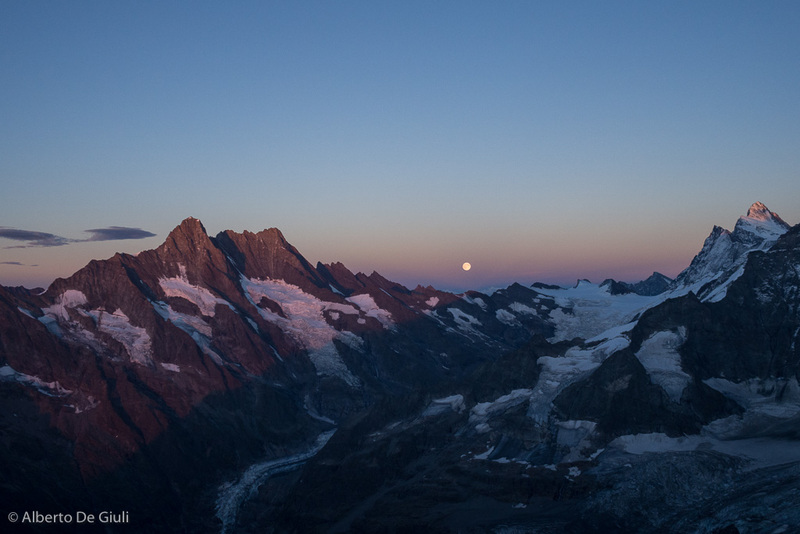 It was definitely the most beautiful week of my guiding summer season 2015. 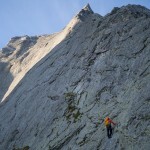 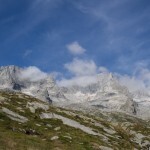 The north ridge of Pizzo Badile. 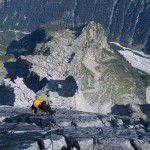 Climbing the first pitches of the north ridge of Pizzo Badile. 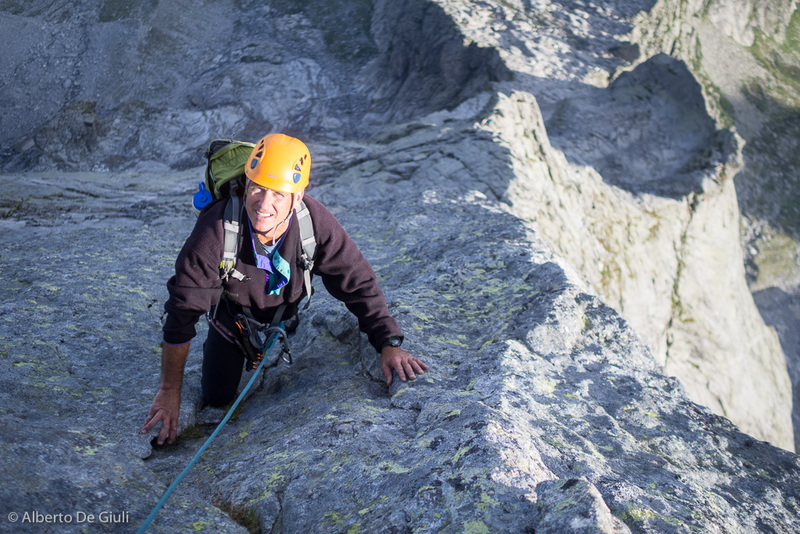 Climbing the north ridge of Pizzo Badile. 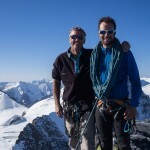 On top of Piz Badile, after climbing the north ridge. 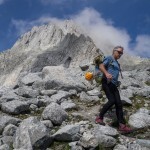 Hiking down to the Giannetti Hut. 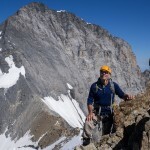 North ridge of Piz Badile. 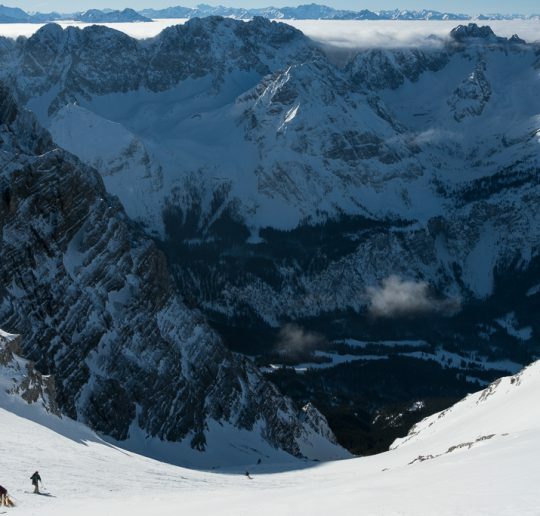 Hiking down Val Porcellizzo. 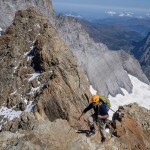 North ridge of Piz Badile. 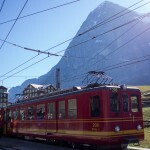 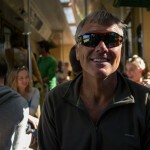 Marty on the train to Kleine Scheidegg. 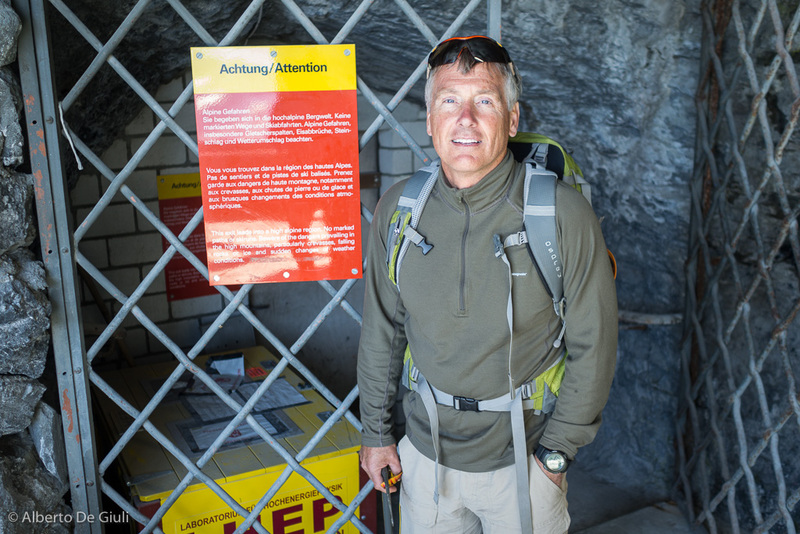 Marty in front of the “warning” door at the Eismeer train station. 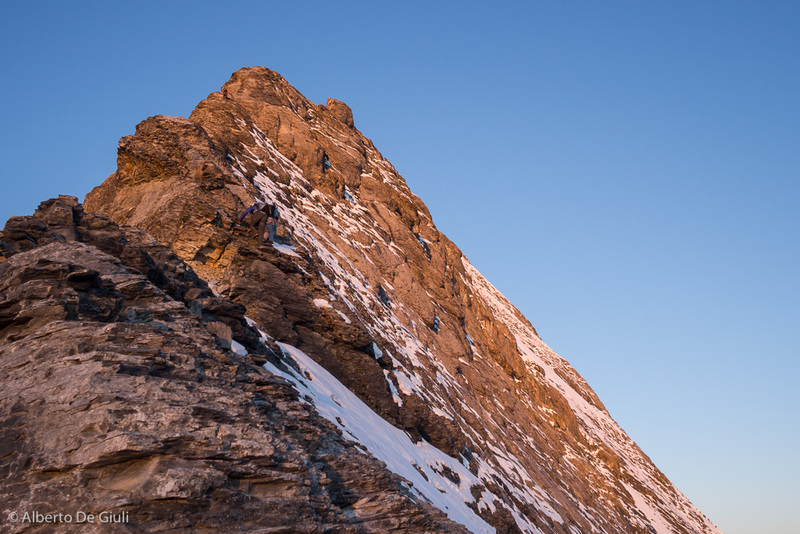 Mittellegi Ridge, Eiger. 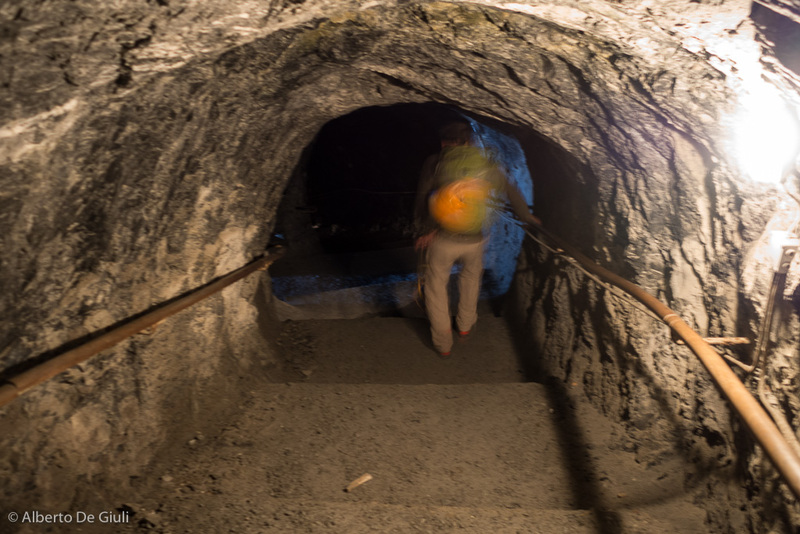 Down the spiral staircase in Eismeer. 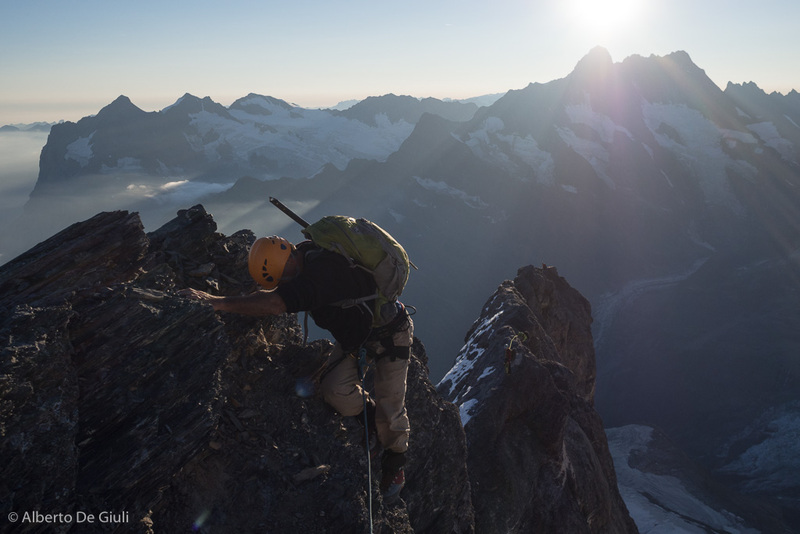 Mittellegi ridge, Eiger. 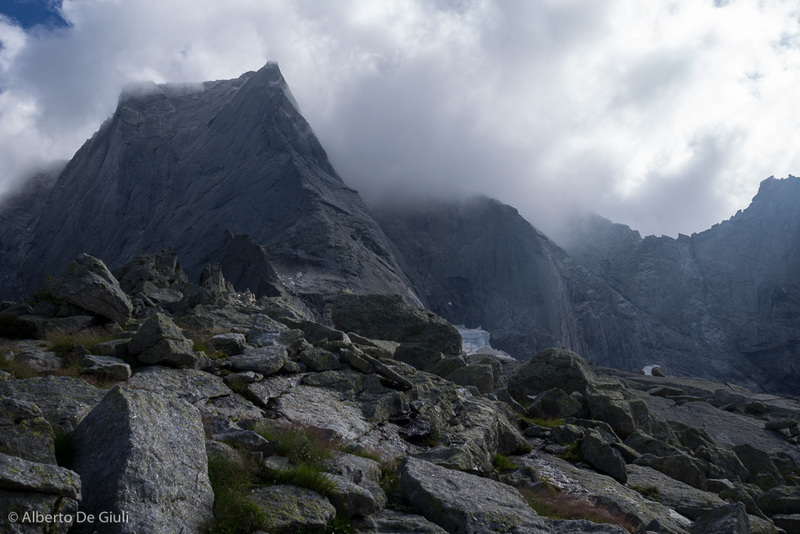 Across the Challifirn. 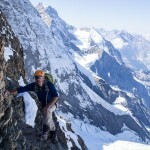 Mittellegi ridge, Eiger. 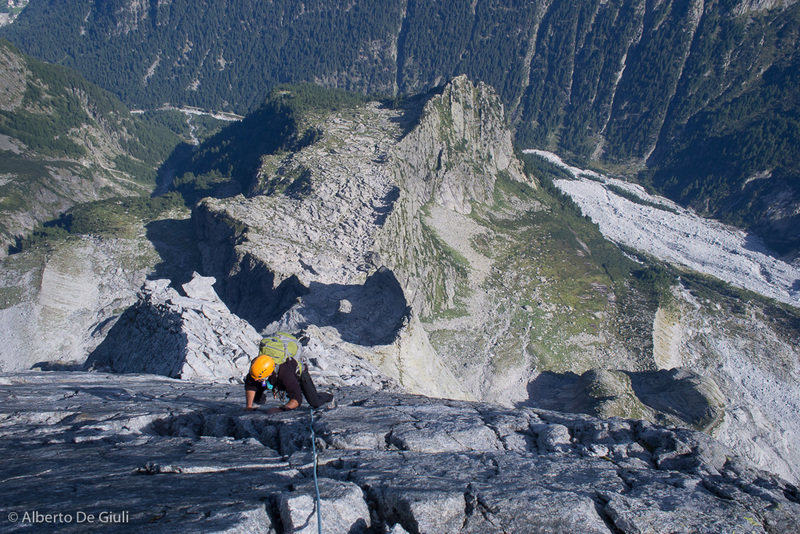 The first technical pitch above the Challifirn, 25 meters graded IV, the “entry test” for the Mittellegi ridge. 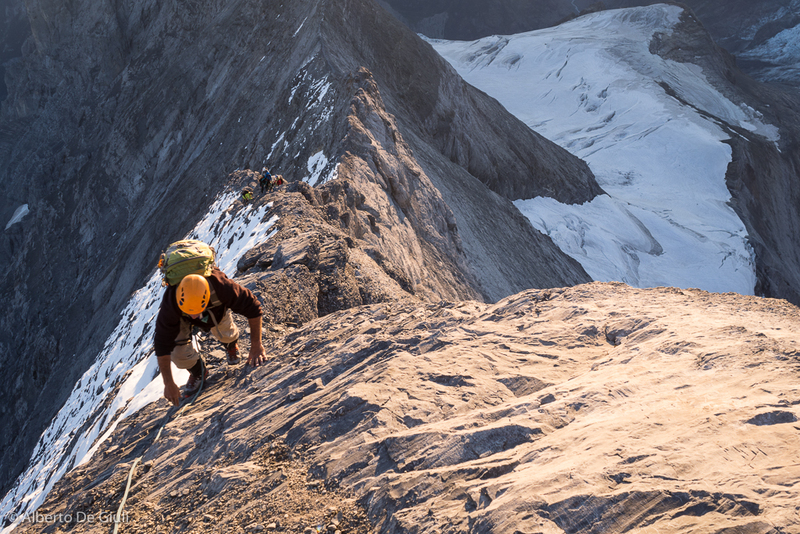 Steep terrain with lots of loose rock to approach to the Mittellegi Hut. You get to the Mittellegi hut in a couple hours from Eismeer. 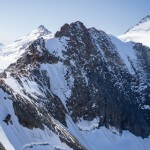 The Mittellegi ridge, steep and exposed as it looks from the Mittellegi hut. 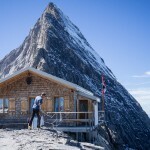 The reservations book at the Mittellegi hut. 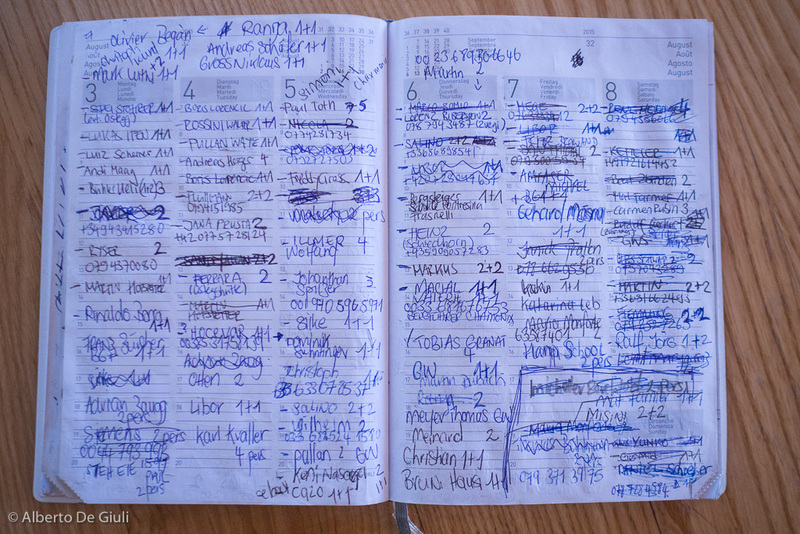 Busy times! 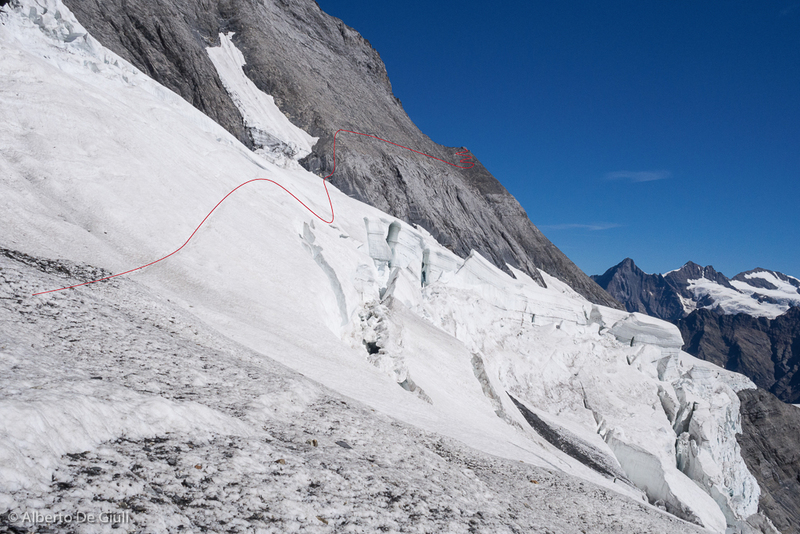 Looking down the approach route to the Mittellegi hut from its balcony. 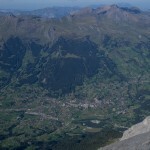 Grindelwald from the Mittellegi Hut. 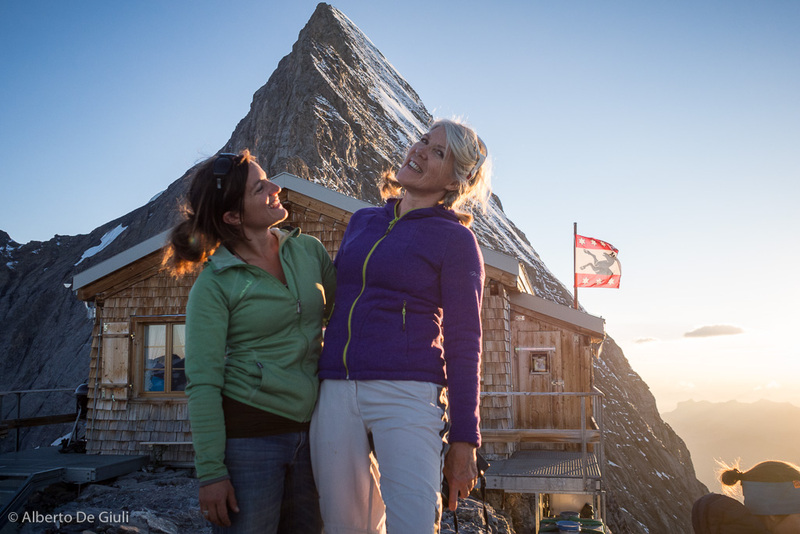 Corinne (to the left), hut keeper and great chef of the Mittellegi Hut. 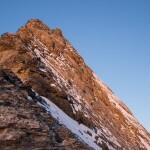 The Mittellegi ridge at sunset. 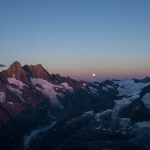 Full moon over the Bernese Oberland. 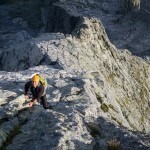 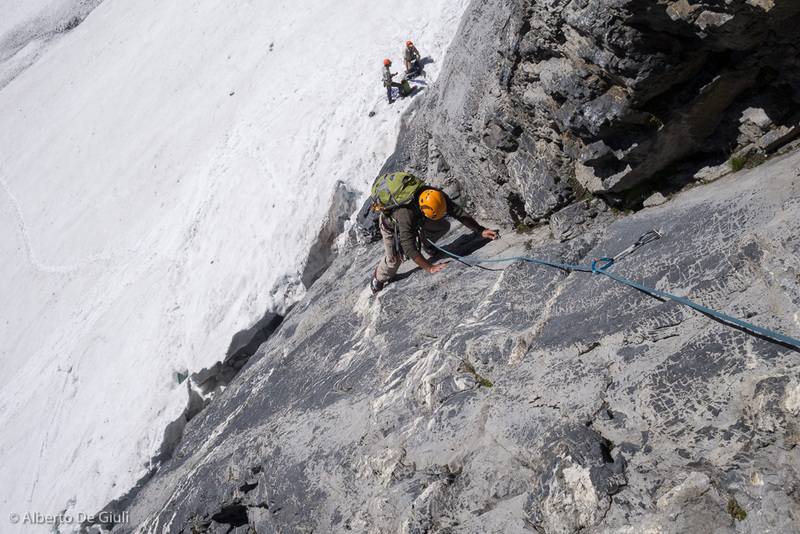 Climbing the fixed ropes on the Mittellegi ridge after the Gran Gendarme. 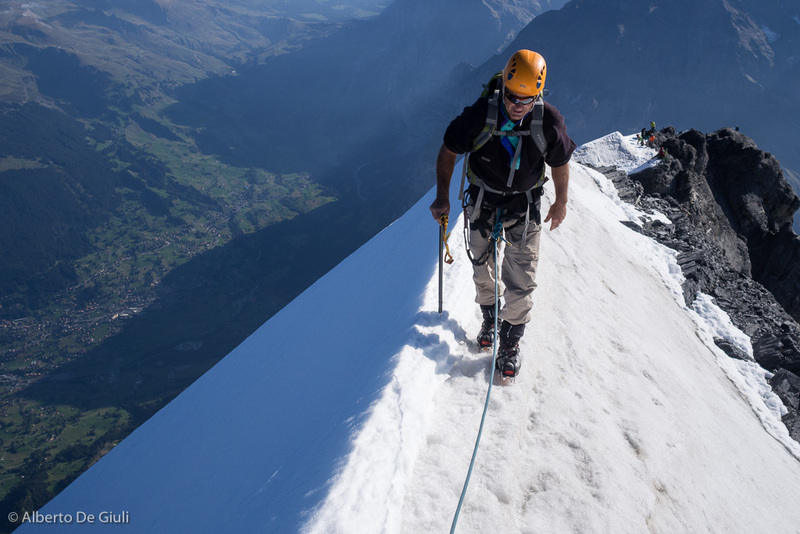 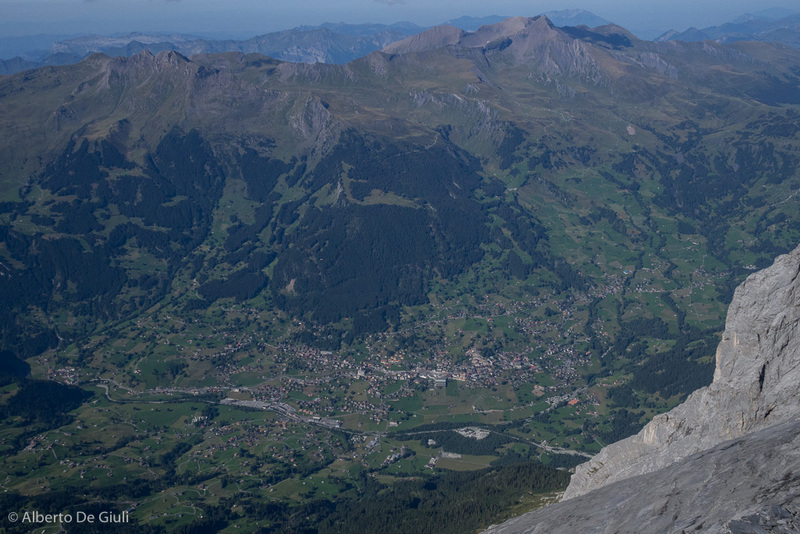 Climbing the last section of the Mittellegi ridge, Eiger. 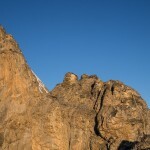 Le rocce sommitali. 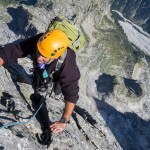 Mittellegi, Eiger. 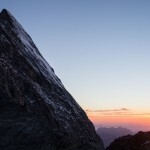 The shadow of the summit of the EIger from the Mittellegi ridge. 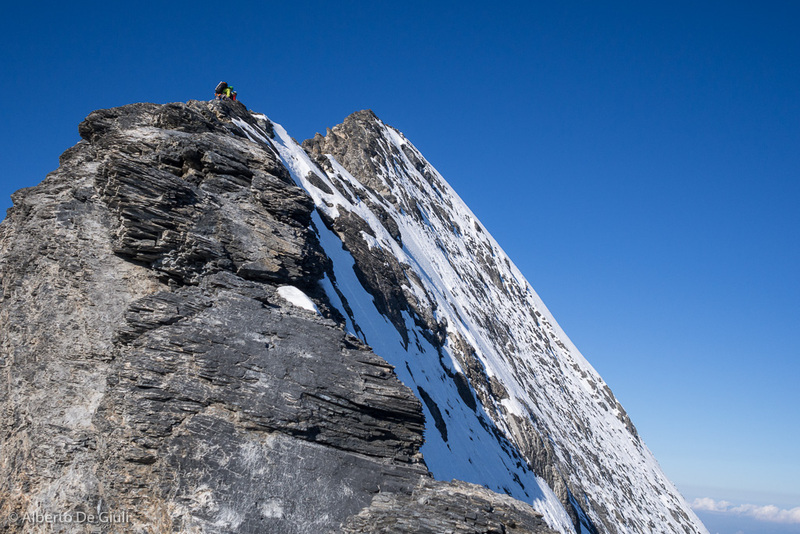 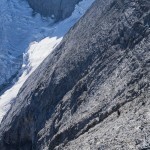 The last exposed snow ridge on the Mittellegi ridge, Eiger. 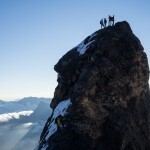 On top of the Eiger. 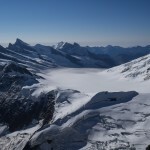 Looking down the Ewigschneefäld glacier from the top of the Eiger. 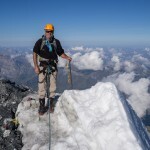 Marty on top of the Eiger. 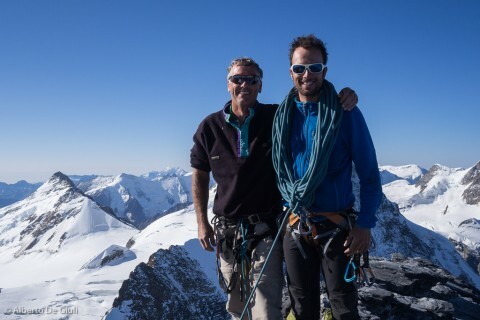 Marty and me on top of the Eiger. 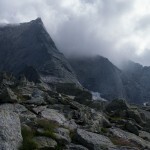 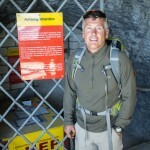 The route from the Eigersjoch to the glacier below the Monch. 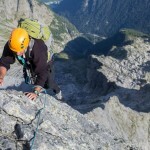 Climbing in the Dolomites in July. 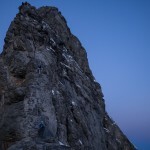 Campanile Dulfer, Gusela del Nuvolau, First and Third Pillar of Tofana di Rozes, Punta Fiames Iori South Arete, Torre Piccola del Falzarego and Cinque Torri.